5-Stars! Romantic Luxury Cottage on 3.5 Acres W/ Beautiful Views! "Our 3rd fall stay at Bella Vista Cottage was just as wonderful as our first and second! We stayed five days and traveled throughout the region during the day while coming "home" at night to cook in the well stocked kitchen and enjoy the fireplace. The view from this cottage is one of the best - mountains and the lake! Monica and Ed have thought of many details to make you feel that you are staying at a friend's home, not just a rental unit. This is the place to go to relax and unwind! - Pam and Clay W., Metairie Louisiana"
Just 2 hours from Atlanta GA, Chattanooga TN, Asheville NC and Greenville SC, our home “Bella Vista” (Beautiful View) is the perfect destination to get away from it all. 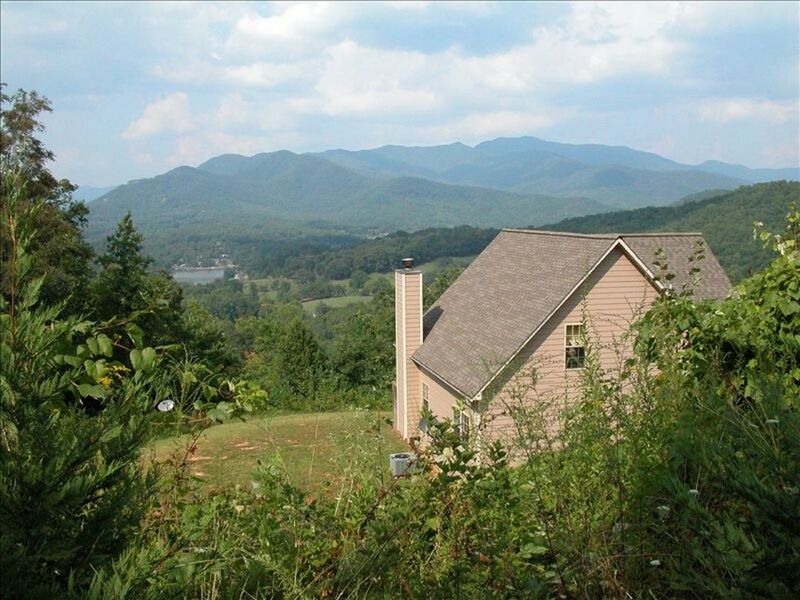 Overlooking the Great Smoky Mountains and nestled among 3.5 quiet acres, our private cottage has views of the mountains and Lake Chatuge. Please take a minute to click on REVIEWS to read why over 80 guests have given Bella Vista 5-stars! At Bella Vista, we want you to simply bring your clothes and relax. All the small things are provided for you... hair dryers, (even curling irons), hotel toiletries, bed, bath and kitchen linens, laundry and dish soap, paper towels, napkins, foil, spices, kitchen staples such as coffee, tea, flour, sugar, and much more. Bella Vista Cottage is for couples and friends who will appreciate all the creature comforts of home while spending time in our smoke-free, PET-FREE and NEIGHBOR-FREE, cottage in the mountains. Enjoy a spring rain shower under the covered porch, a breezy afternoon on the open deck, or take a short drive to Brasstown, the highest peak in Georgia, where you can take in breathtaking views of four surrounding states. Even closer is Bell Mountain with AMAZING 360-degree views of awesomeness! By day, explore the spectacular mountains, and many other activities in the area. By night curl up with your favorite book, movie or board game. Bella Vista truly has something for everyone. "Our stay at this beautiful home was just perfect. We enjoyed the views, which differed each day. We enjoyed hiking, as well as visiting numerous interesting stops in the region. Above all, we enjoyed the peace of mind that was possible simply because we had rented from excellent owners. Monica and Ed provided everything we would need. Their care for their home transcended to us, the tenants and that meant lots. We highly recommend Bella Vista Cottage and look forward to returning in the near future. - Raul A." For those with flexible schedules, why not take advantage of our Bella Vista Cottage Mid-Week Special? Check-in on a Sunday and stay four nights for the price of three! Standard nightly rate is $150 / Holiday periods are $170 per night. Please note that by reserving at Bella Vista you acknowledge that you have been informed that there is an exterior security camera on the property for your security and the security of our home during periods between scheduled rental guests. This camera monitors only the driveway, the front walkway and the steps up to the front door. With a 128 miles of shoreline, Lake Chatuge is beautiful and clean and ideal for swimming, boating and fishing. Boat and jet-ski rental is available just a half-mile away, and Bella Vista is located less than 5 minutes from two marinas on the shores of Lake Chatuge. Nearby Jackrabbit Campground offers a public boat launch, picnic areas and a beach swimming area. For the land lover, there are local wineries, antique stores, horseback riding, restaurants, shopping, plenty of hiking trails, and two 18-hole golf courses nearby. Enjoy events, concerts and festivals year round in downtown Hiawassee, the surrounding areas, and the GA Mountain Fairgrounds. However, the real appeal of Bella Vista is the peace and relaxation you’ll experience just absorbing the view from the comfort of this luxurious cottage. We are a professional couple with no children, who love getting away to the peace and serenity of the mountains. We also enjoy sharing relaxing fun times with family and friends. Bella Vista Cottage is the perfect place for us to spend time with people we love & we feel blessed to be able to share it with others. Our home is our sanctuary and on 3.5 private acres, surrounded by natural beauty, it can't be beat. Songbirds, hummingbirds and wildlife are frequent visitors to our getaway retreat and when we're there, we feel so at peace and relaxed. We know you will too! We looked at homes on other lakes in both the Carolinas but when we saw the Lake Chatuge area, we immediately knew this was the lake for us! Surrounded by mountains, it was the most beautiful lake we had seen and there is so much to do in the immediate area. Our home is located on 3.5 private (mostly wooded) acres in a nice, quiet, high-end community, which we appreciate. We enjoy sharing our fabulous find with others and hope you'll love it as much as we do! Bella Vista Cottage is located on 3.5 wooded and private acres, yet it's easy to get to with any kind of vehicle. We have gorgeous views, lots of windows, and no visible neighbors. We are six miles from Hiawassee, 25 minutes from Crane Creek Winery and there is a lot to do in the area, including boat rental and other lake-related activities. Our home offers all the creature comforts of home in a beautiful mountain setting we know you'll love! toilet, shower, Spacious room & spacious shower with separate water closet. Beautiful stone tiled showers (no bathtubs in the house) in each bathroom. Double sinks in the master bath. Plenty of towels and wash cloths provided, as well as basic toiletries, hair dryers and curling irons. Very private, no buildings or obstacles, no neighbors, and beautiful views of mountains and water! Very private, no obstacles, no neighbors and wonderful views! PLENTY of clean towels, sheets and kitchen linens are provided! All towels provided, including beach towels and chairs. Comfy livingroom with gorgeous mountain and lake view! Elevated for ease of loading and unloading. Silent operation. Side by side with cubed or crushed ice & water in the door. Coffee, tea, sugar, flour, and many pantry food and staples are typically provided. Fully equipped kitchen with everything you need. Knives, silverware, dishes, cookware, bakeware, serving pieces, cocktail & wine glassware. Well-stocked and well equipped with full cooking materials, utensils, pots, pans, baking dishes, etc. Plug in your iPhone or iPod to our dock and listen as loud as you like! Bunches of board games available for chilly rainy days indoors! A selection of roughly two dozen DVD movies. 500 square feet of wrap-around deck. Half is covered, half is open to the sky. We provide beach chairs and towels if you care to play in Lake Chatuge! Very CLEAN, well cared for and well-appointed. Toilet tissue, paper towels, foil, plastic wrap, baggies & trash bags are among the basics we provide. Hair dryers, curling irons, toiletries and all bath & bed linens are also provided. We keep a well-stocked pantry including coffee, teas, creamer, sugar, flour, canned goods, pasta, condiments, salad dressings, spices and you are welcome to whatever adult beverages you find on the bar. We also have a small library of books (bring one to donate if you wish! ), games & DVD movies, plus a bird book & binoculars for bird watchers! Beach towels and chairs are also provided. PLEASE NOTE: By reserving at Bella Vista Cottage you acknowledge that you have been made aware of the exterior security camera which monitors the driveway, walkway and entry stairs. The house is beautiful and well appointed. The view of the mountains is million dollar. We were even blessed to be visited by a mama deer and her few week old fawn. We really enjoyed our stay and the owners were great to work with. There were also lots of hummingbirds at the feeder on the deck. Didn't see any bears at the property, even though they are around there, but we did see a bear cub close by. Totally relaxing, from watching the sun rise over the mountains, to having a cocktail in the evening with a cool breeze on the deck. Convenient to restaurants, hiking to waterfalls, and beautiful Lake Chatuge! Thank you for such a lovely review! We're thrilled you were able to visit and we look forward to your return to Bella Vista. The mountains are wonderful in any season of the year! Living in Columbia, SC, we were looking for a reasonably priced, nice place to stay on a fairly regular basis when we come up to visit our grandbabies. Bella Vista turned out to be the perfect answer to our prayers. If you're looking for a comfortable and affordable vacation spot, Bella Vista could be the answer to your prayers too. This charming little house in the mountains has everything you need to relax and recharge...all the comforts of home and some extras too! A warm, cozy fire on a cold mountain day -- this house has it. Maybe starting your day with a steaming cup of coffee, outside on the deck while being serenaded by a chorus of birds is your style -- this secluded little spot has this too! A beautiful two bedroom (one is a loft with a FABULOUS view) house, this is the perfect size for a couple or two (we've brought my parents up) to hang out and enjoy all the charm of the surrounding mountains and Chatuge Lake. Antique shops and restaurants abound nearby, but I have to say I love cooking in this kitchen. It is the best organized and most efficient kitchen I've experienced. The beds are very comfortable and linens and towels are always clean, fresh, and plentiful. Overall, this has become my favorite place to come to relax and recharge. Standard nightly rates are $150. Holiday periods are $170/night and we don't charge more for weekends! NOTE: IF YOU USE THE "BOOK IT" feature please let us know if the amount isn't what you expected and we'll confirm actual numbers with you before you commit to your stay! :o) Take advantage of our Mid-Week Special: Check in on SUNDAY, stay four nights and one of your nights is FREE!